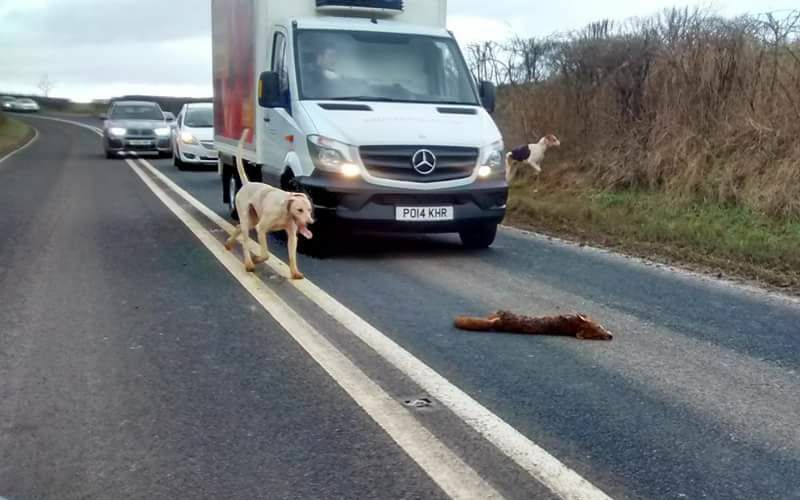 A fox was attacked by a pack of dogs on a busy main road causing several vehicles to stop as the incident took place. Several members of the public reported yesterday’s incident to North Yorkshire Police who are now investigating. According to social media reports, the fox died as a result of the attack but police were unable to confirm this at this stage of the investigation. A force spokesperson said that at about 1.40pm police were called to the B1249 between Foxholes village and Staxton Hill, after reports of a number of dogs attacking the animal in the carriageway. Several vehicles were forced to stop at the scene, and officers are appealing for anyone who witnessed this to get in touch, in particular the driver of a Sainsbury’s van, which may have been first at the scene. Witnesses are asked to call North Yorkshire Police on 101 with any information, or email neil.cholmondeley@northyorkshire.pnn.police.uk. Quote reference number 12170026974. WG: As can been seen in the photo, these were foxhounds. A witness has contacted us to state that the Middleton Hunt met at nearby Ganton shortly before the fox was killed.